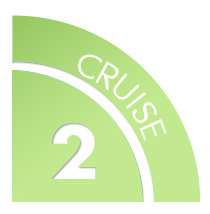 The Cruise phase is the second phase of the Dukan Diet. It reintroduces vegetables with Proteins and Vegetables (PV) days and establishes the 100 unlimited allowed foods as a base. The goal of the Dukan Diet Cruise phase is steady weight loss until you reach your True Weight. Weight loss in the Cruise phase is gradual - on average, 1 lb. every 3 days. The desired effect is to get rid of body fat while maintaining lean body mass. In addition to the 68 allowed proteins in the Attack phase and on PP days, you can add 32 non-starchy vegetables on PV days while on the Cruise phase. The 100 allowed foods list contains foods that will supply you with vitamins, minerals, and fiber, thanks to their nutritional diversity. These foods make Dukan Cooking easy. Alternation is always made up of the exact same number of Pure Protein (PP) and Proteins and Vegetables (PV) days. For example: 1/1 means 1 day of Protein and Vegetables followed with 1 day of Pure Protein and so on. If you are stagnating, you can use a higher alternation such as 2/2, 3/3, 4/4 or 5/5. The 5/5 is especially recommended for people who have a lot of weight to lose. On the Dukan Diet Cruise phase, 30 minutes of brisk walking will help maximize your weight loss. The Dukan Diet is a comprehensive diet plan broken down into 4 phases: 2 phases to lose the weight and 2 phases to keep it off forever. Completing the third and fourth phases of the Dukan Diet, the Consolidation phase and the Stabilisation phase, will determine whether or not you will maintain your True Weight for life.